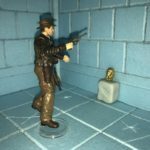 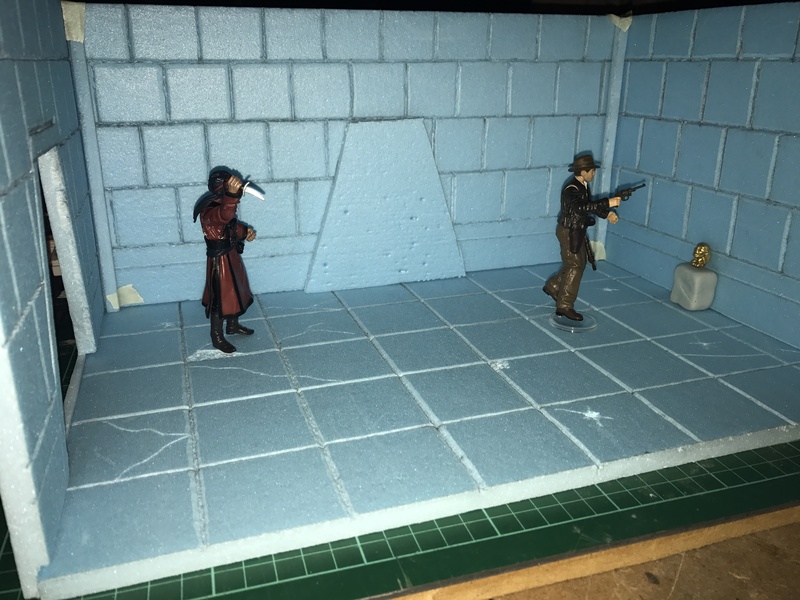 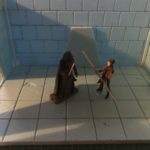 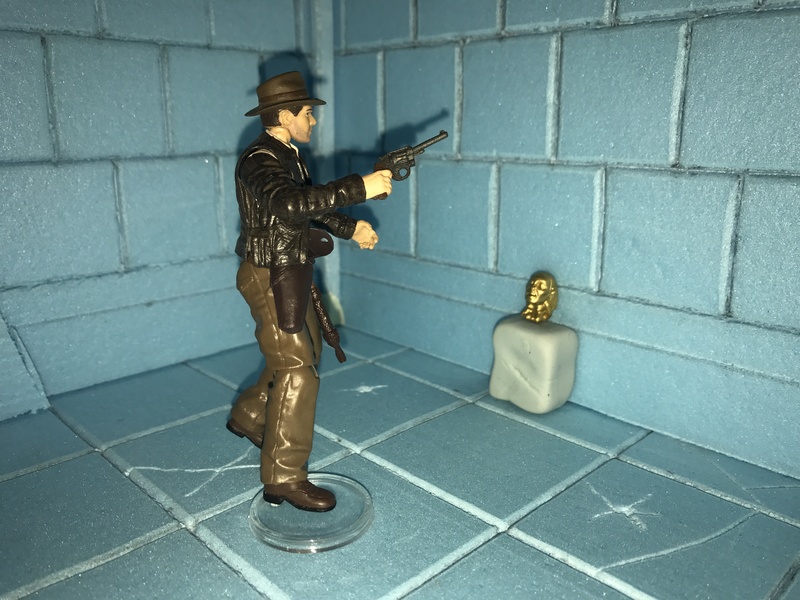 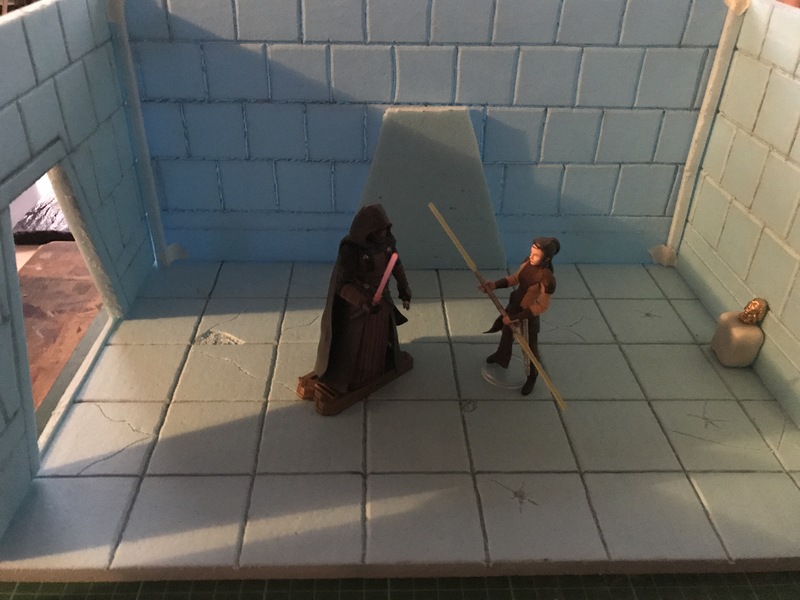 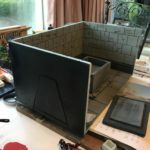 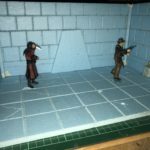 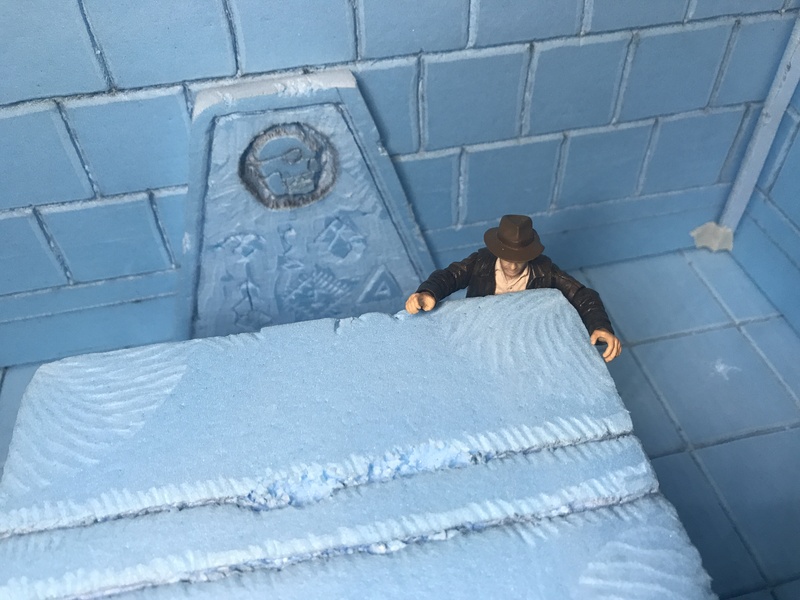 Built to fit 3.75 inch action figures and using the same size to the Arashikage Dojo, I took inspiration from SWTOR, Indiana Jones, G.I. 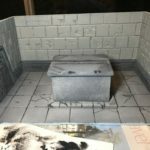 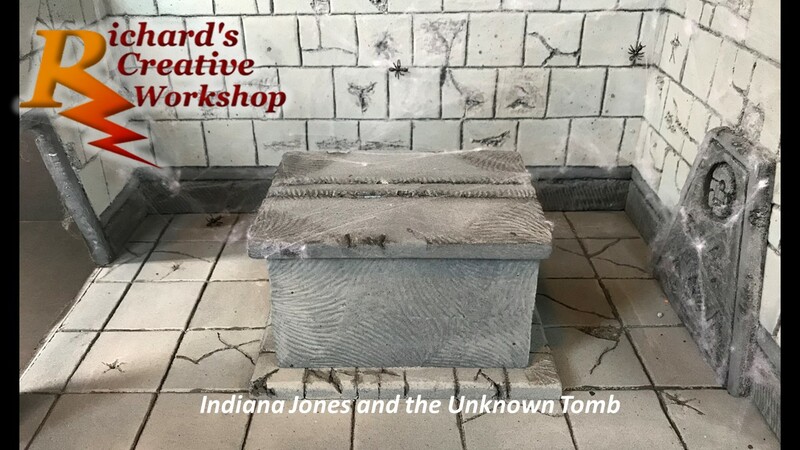 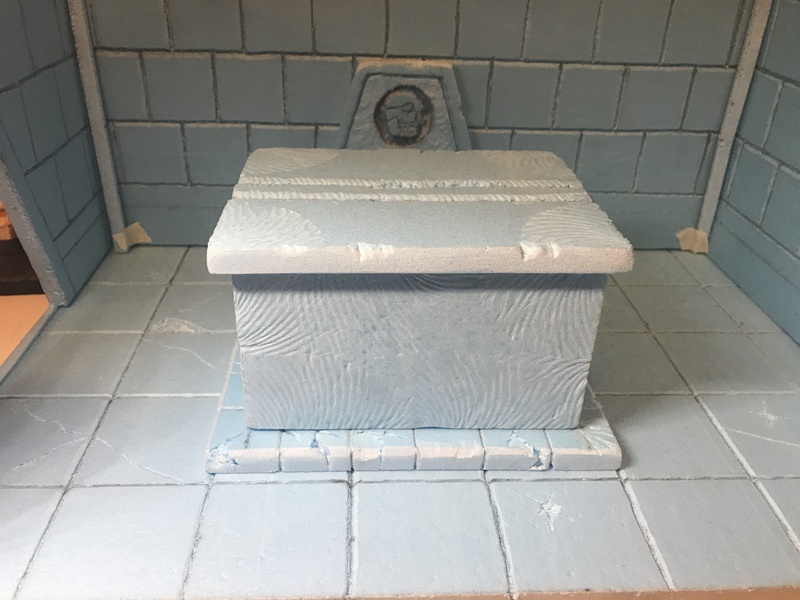 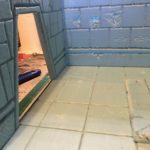 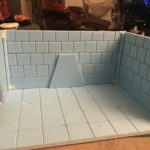 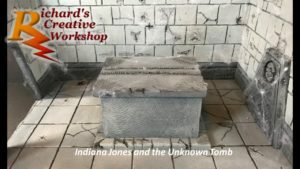 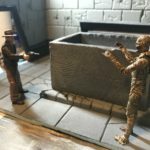 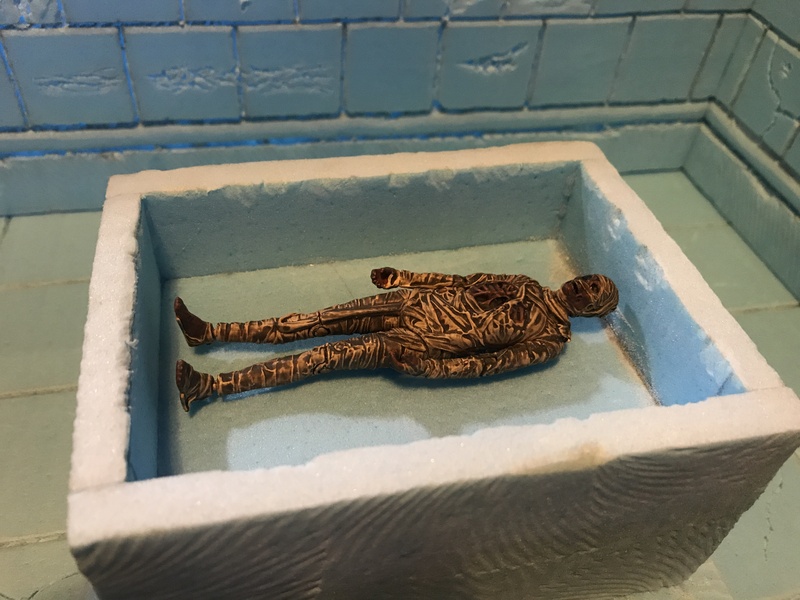 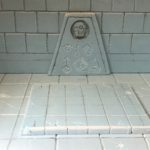 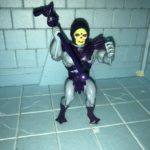 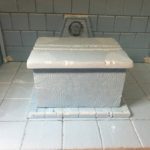 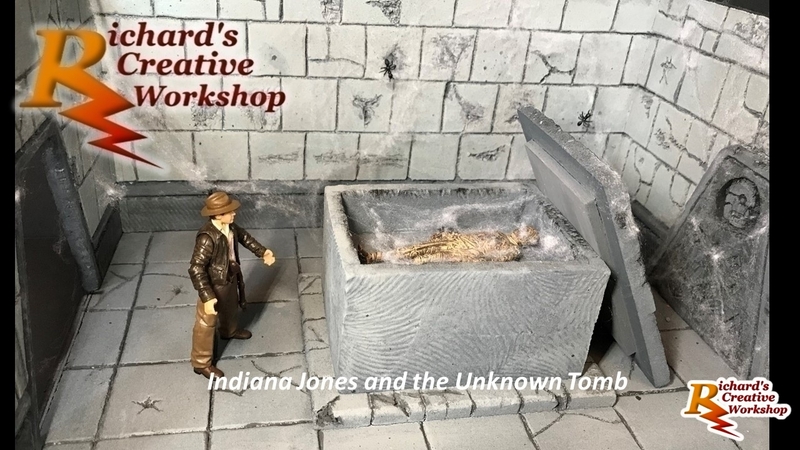 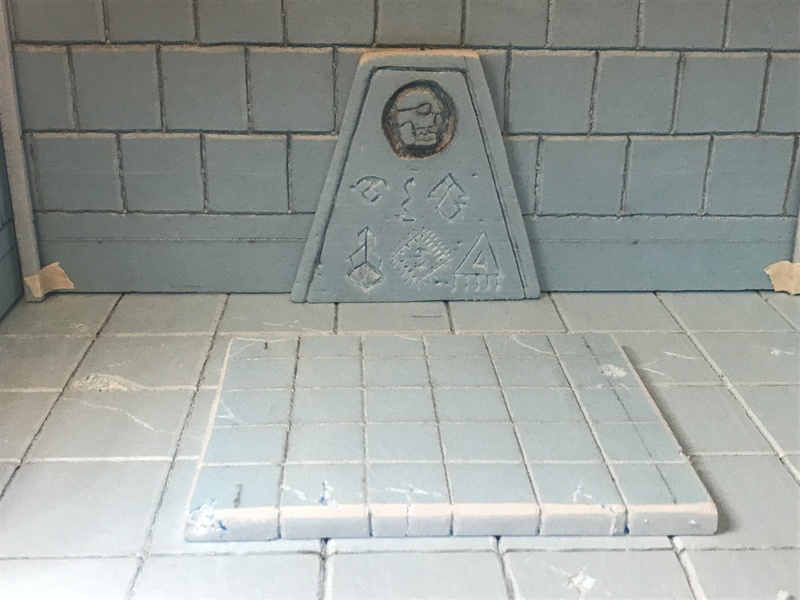 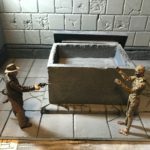 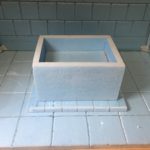 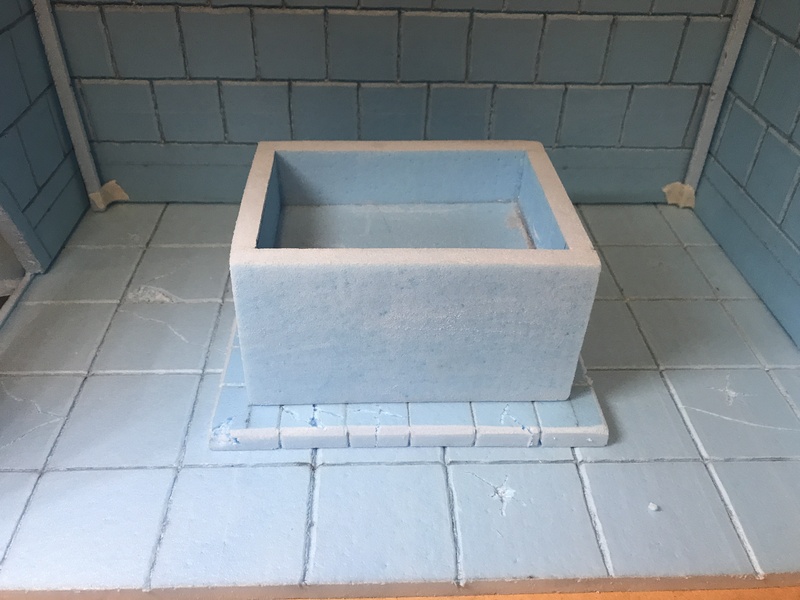 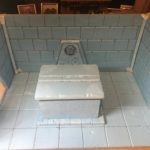 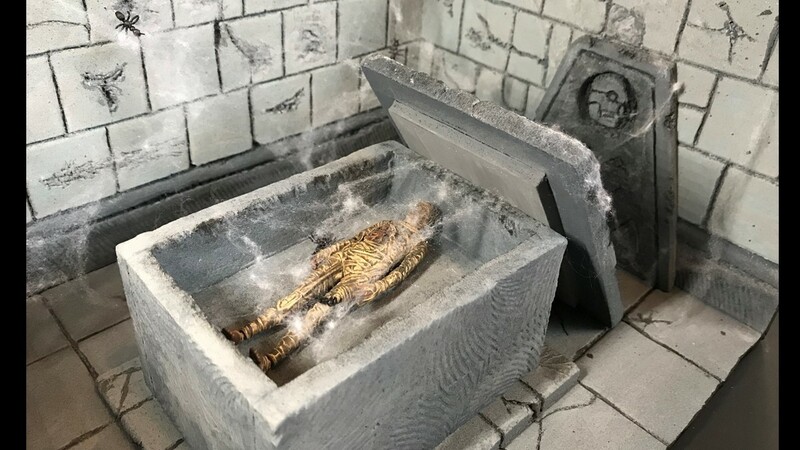 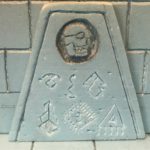 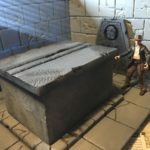 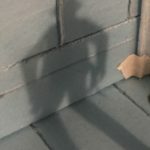 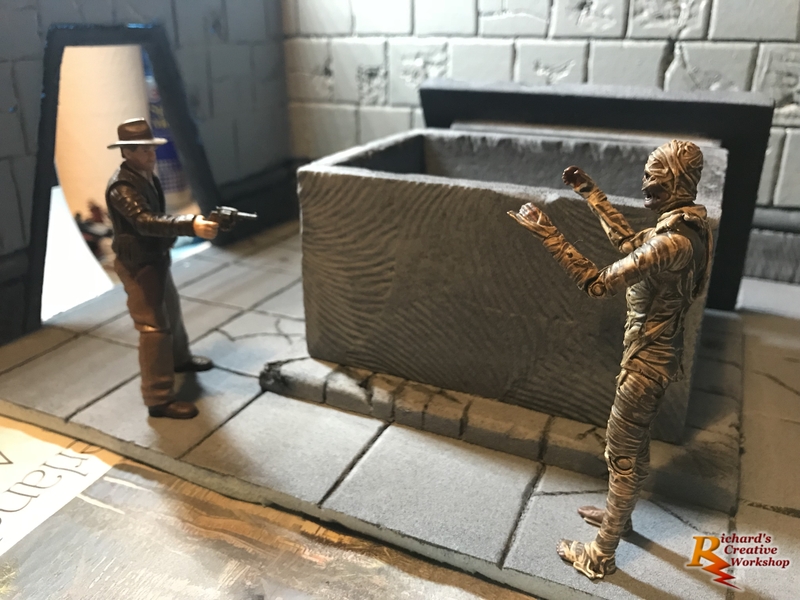 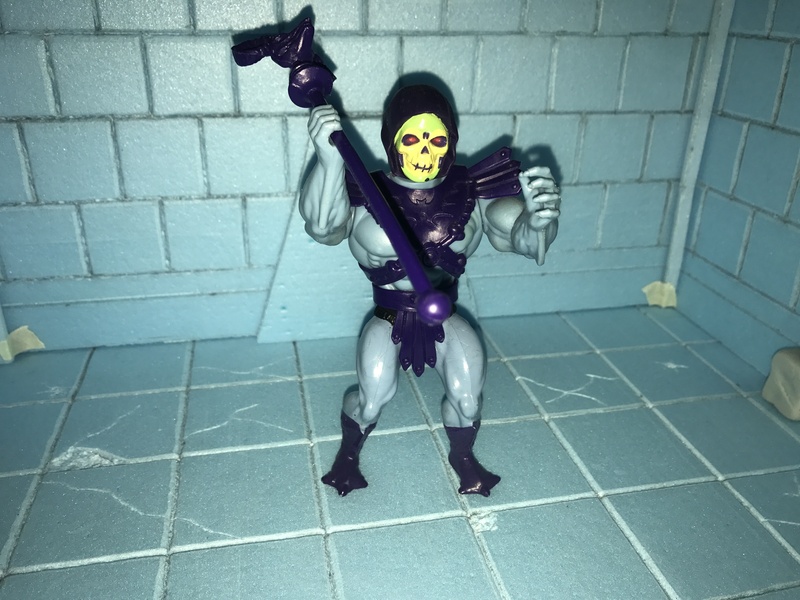 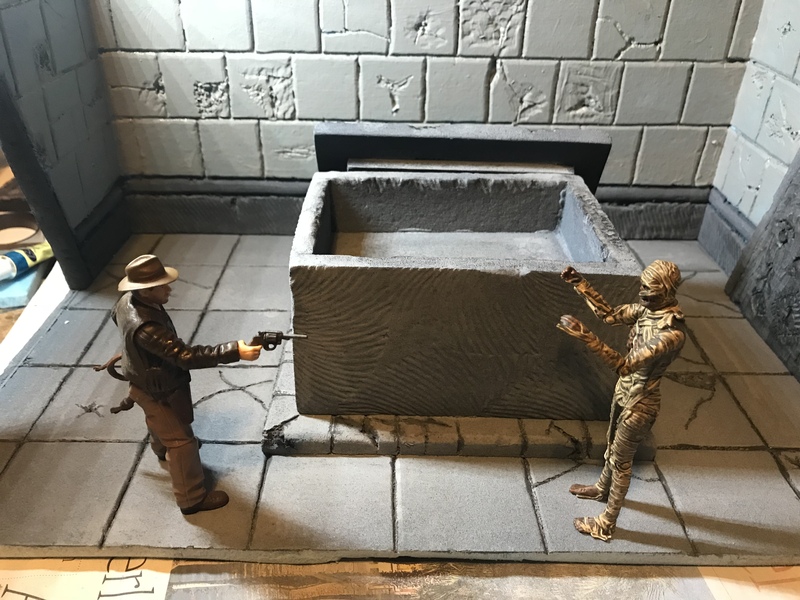 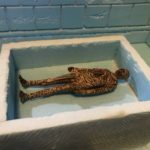 JOE and even He-Man I am putting together a simple tomb/crypt diorama which can be used for any 3.75″ genre. 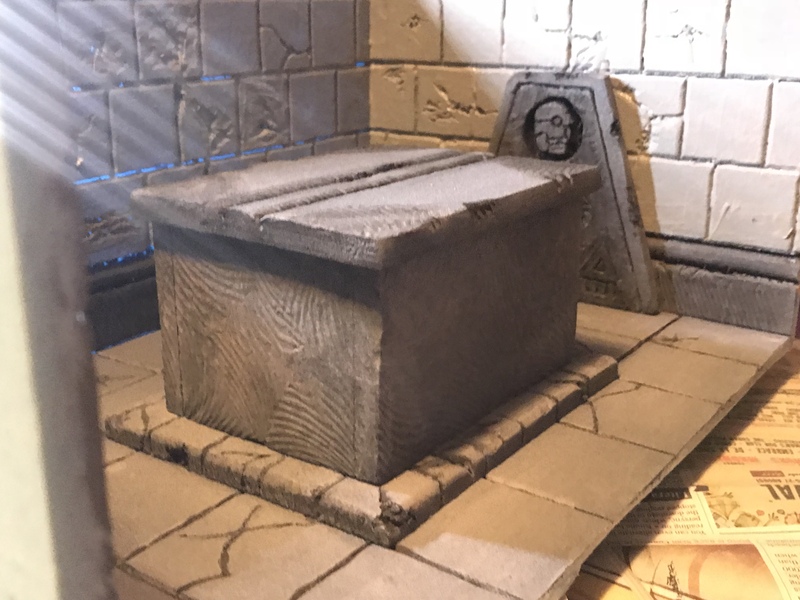 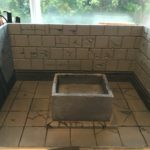 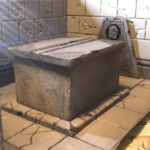 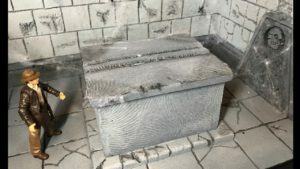 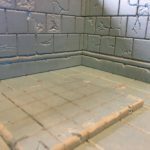 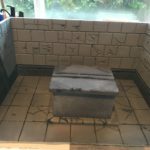 I put together a sarcophagus to sit central in the tomb, adding another layer of slabs to raise it up. 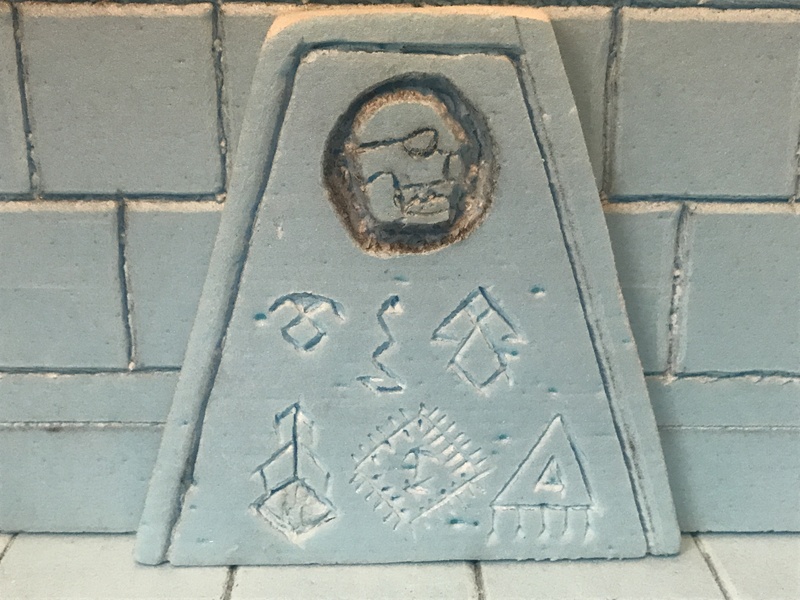 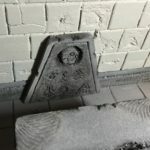 The tablet stone on the back wall, I etched a skull into it, with 6 Mayan symbols. 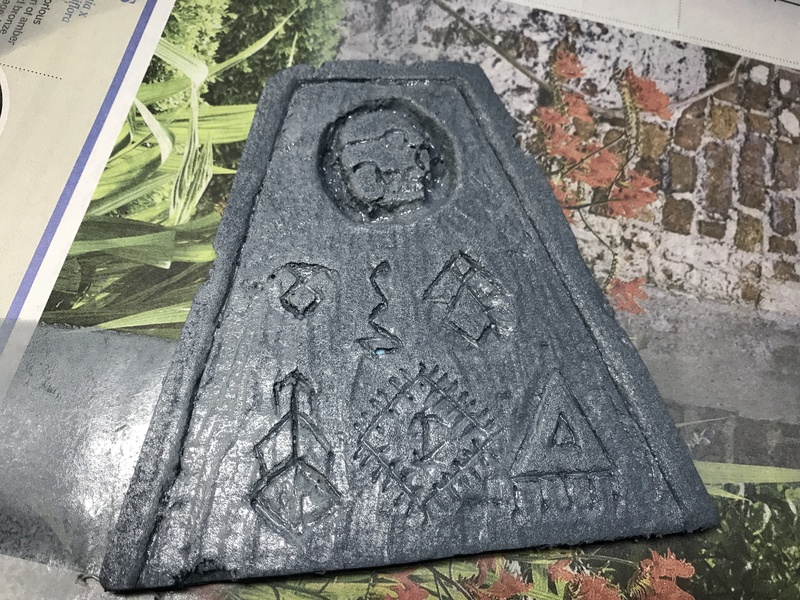 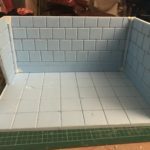 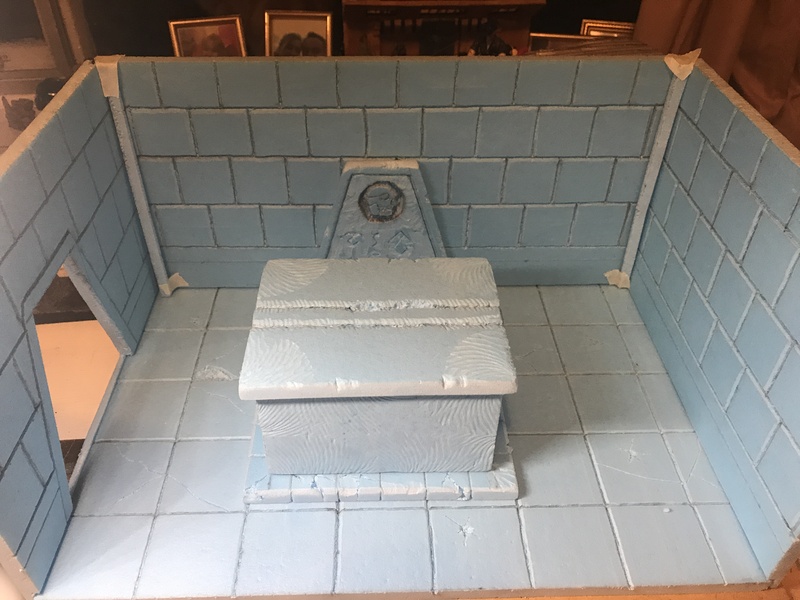 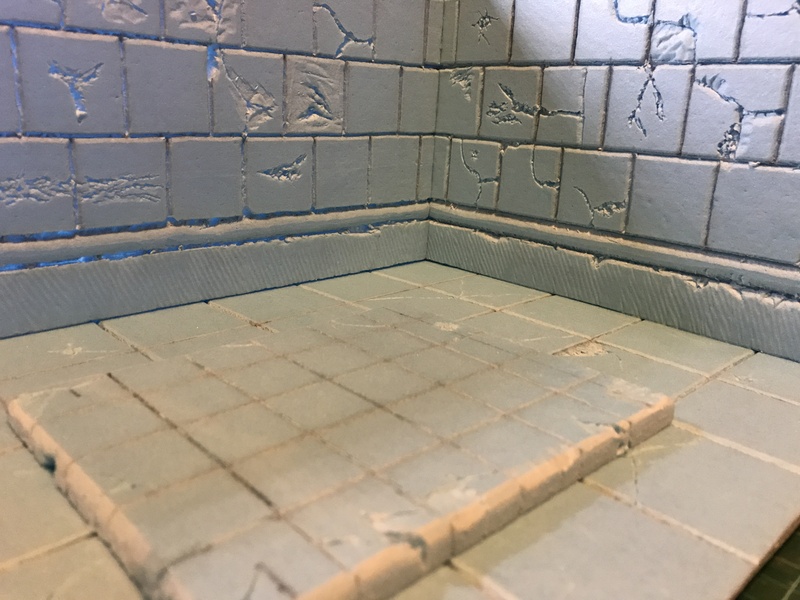 I have spent time weathering the wall and adding more detail to them before applying the first coat of paint, a combination of a light grey with a touch of blue. 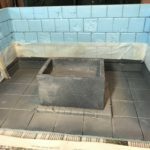 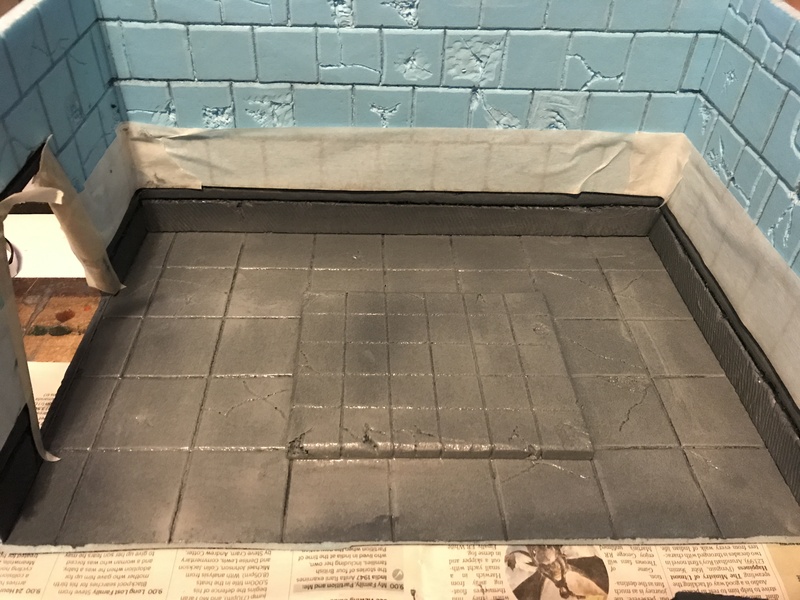 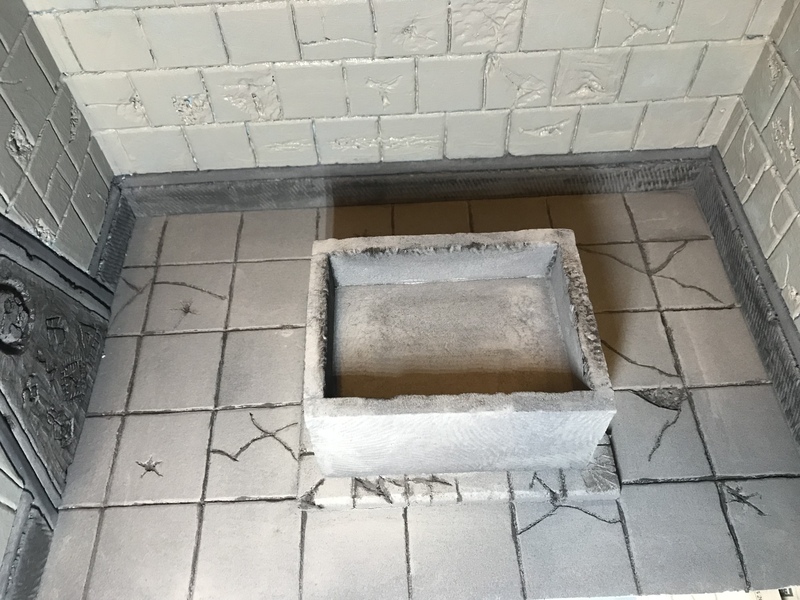 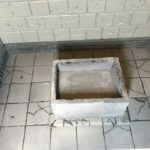 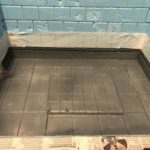 Applied evenly over the floor tiles, sarcophagus, lid and tablet. 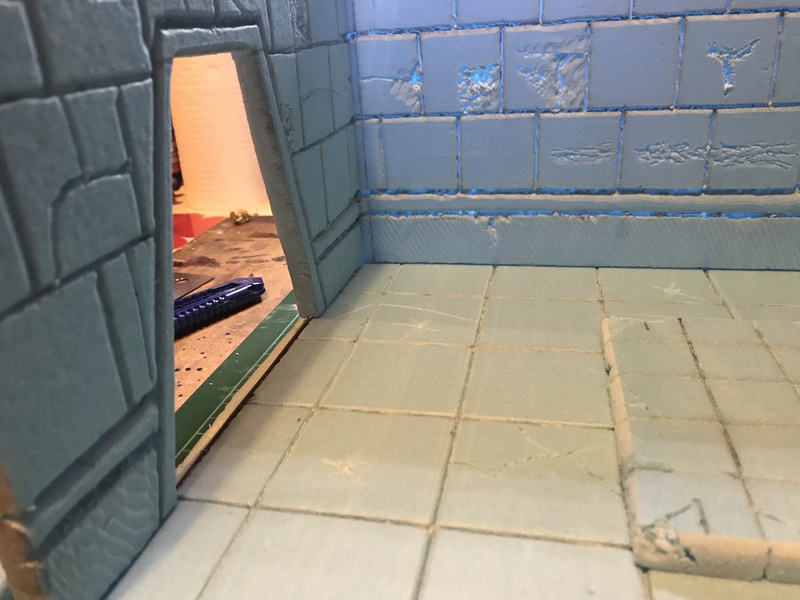 This has been left to dry before a light coat of a light grey sprayed over these areas before diving out the door this morning. 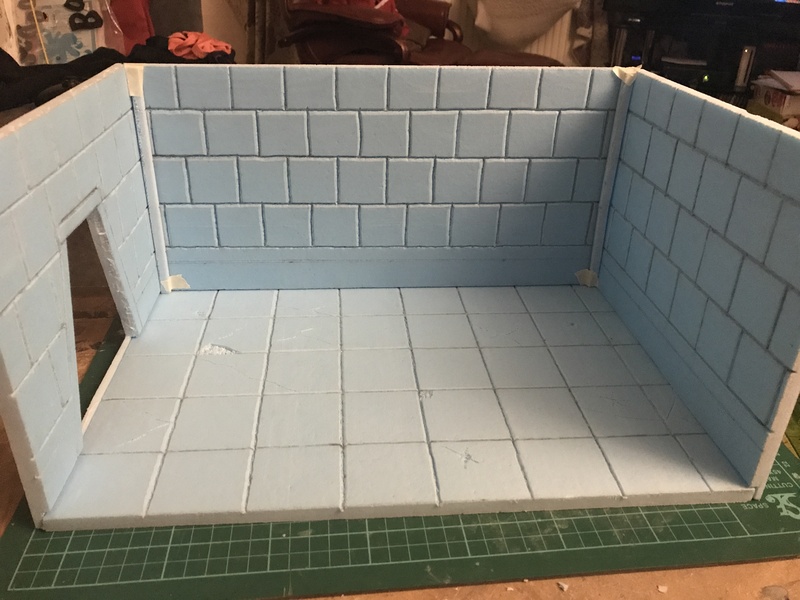 Once it is dry, I will be applying the first coat of paint to walls, using a similar (if not lighter) tone. 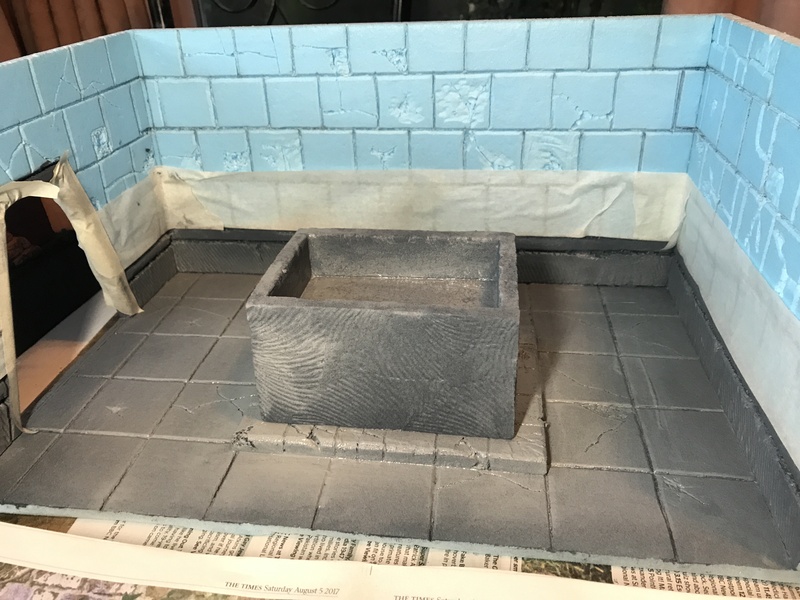 The brick work was given a coat of grey. 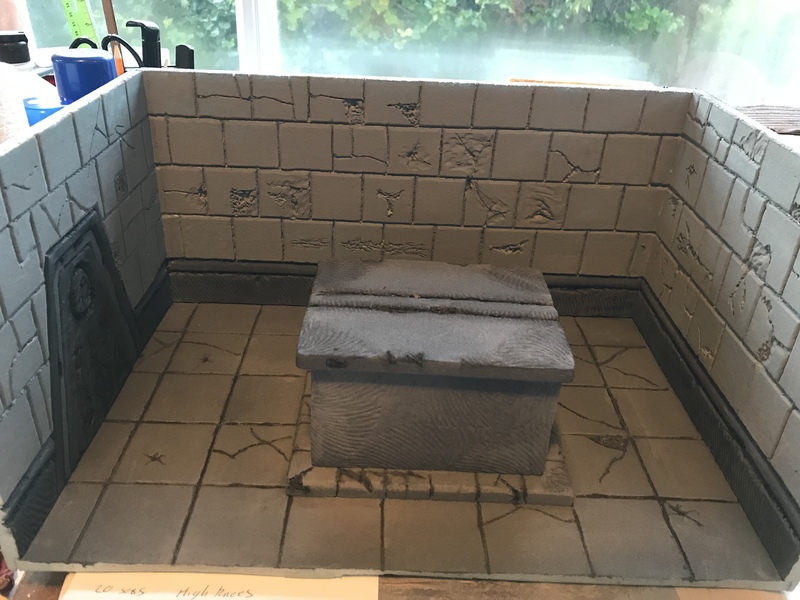 While this was drying I went to work highlighting the stone work, sarcophagus and tablet/door. 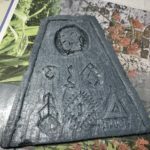 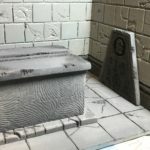 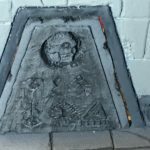 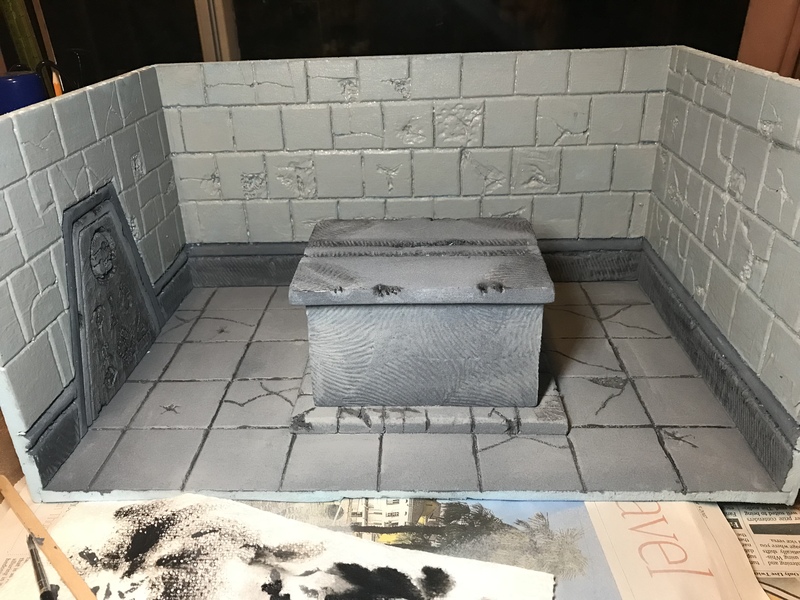 Using a black wash over the sarcophagus and tablet/door and then a light grey wash to pick out the details. 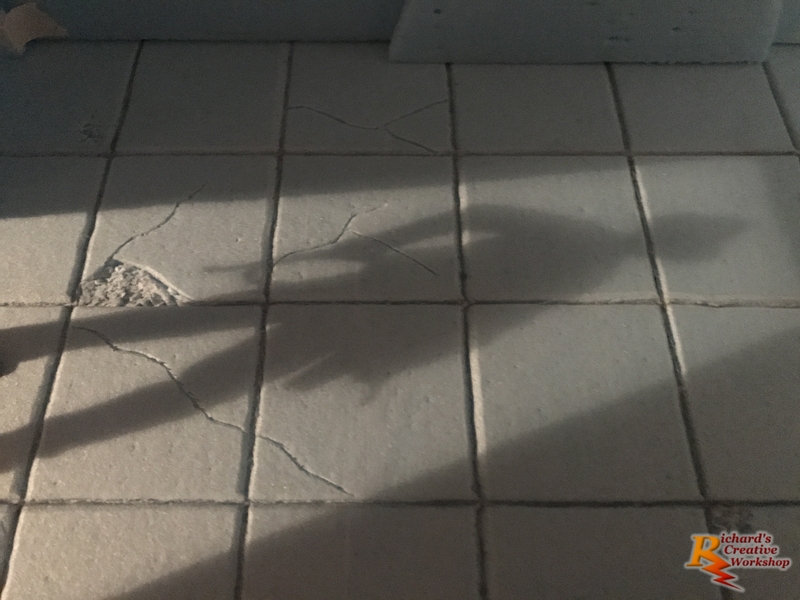 A dark grey for the cracks in the floor. 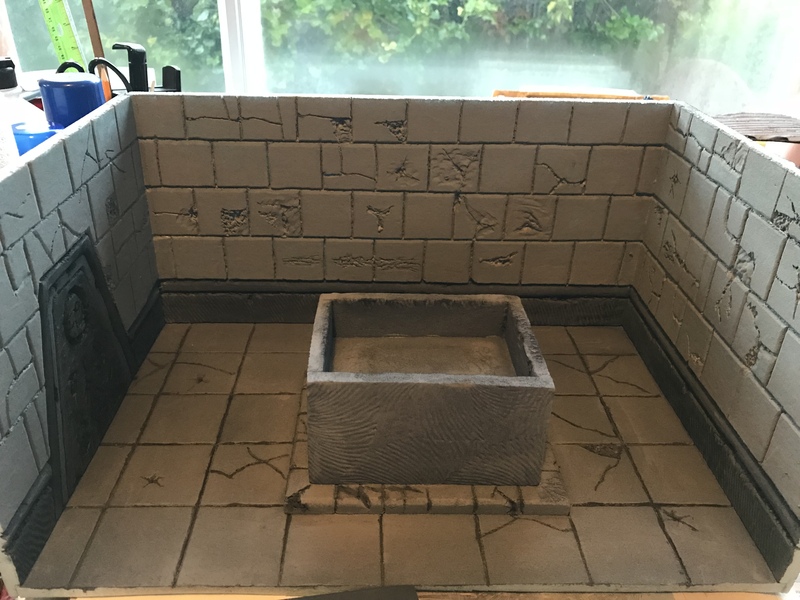 The tablet/door I am now undecided whether to use as a door or a tablet on the walls indicating the contents of the sarcophagus. 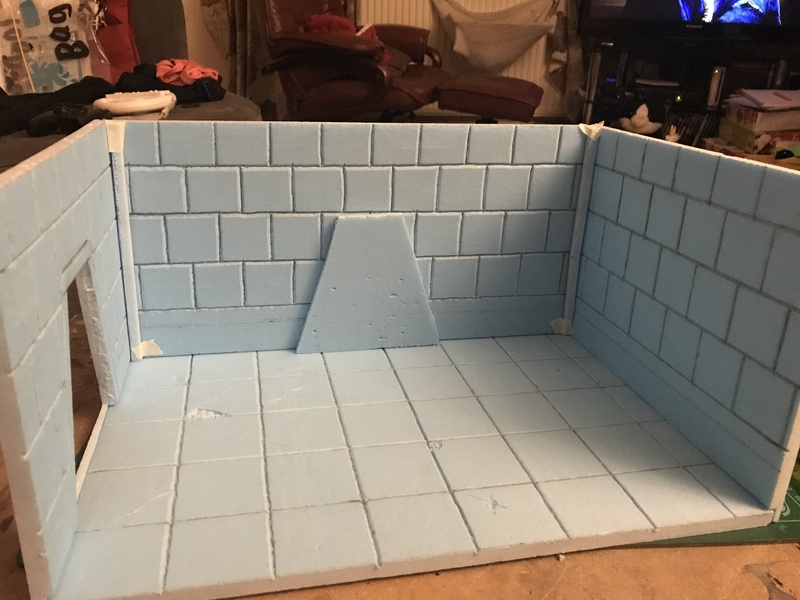 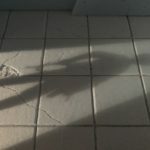 I have taken a lot of pictures to try and get a feel to where it should go. 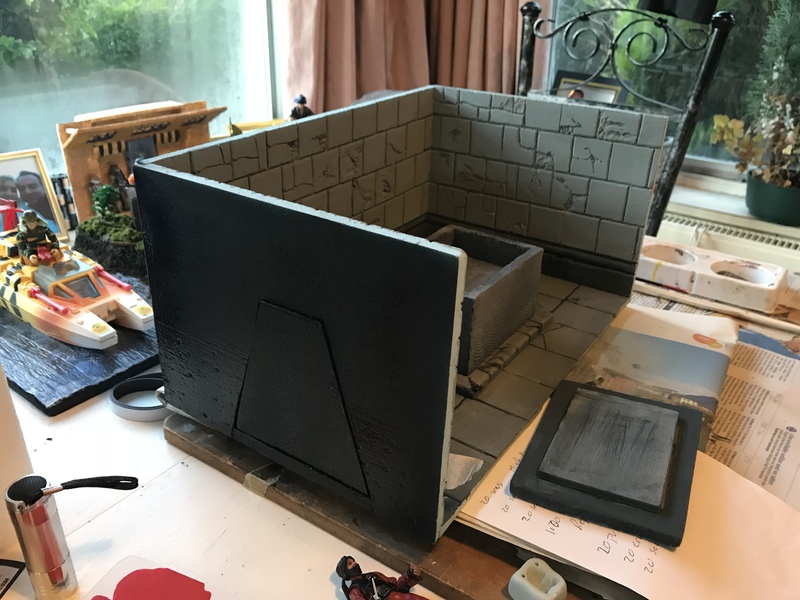 I have sprayed the back with black. 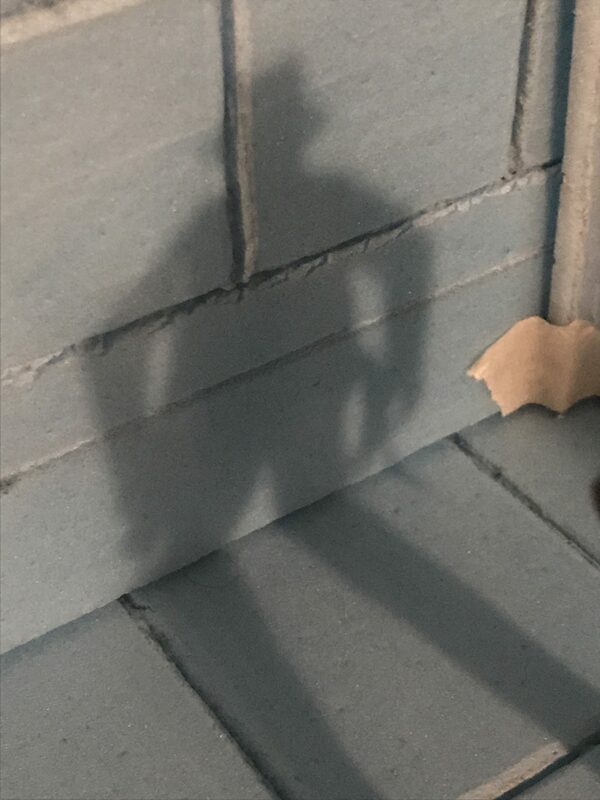 One less thing to have to worry about. 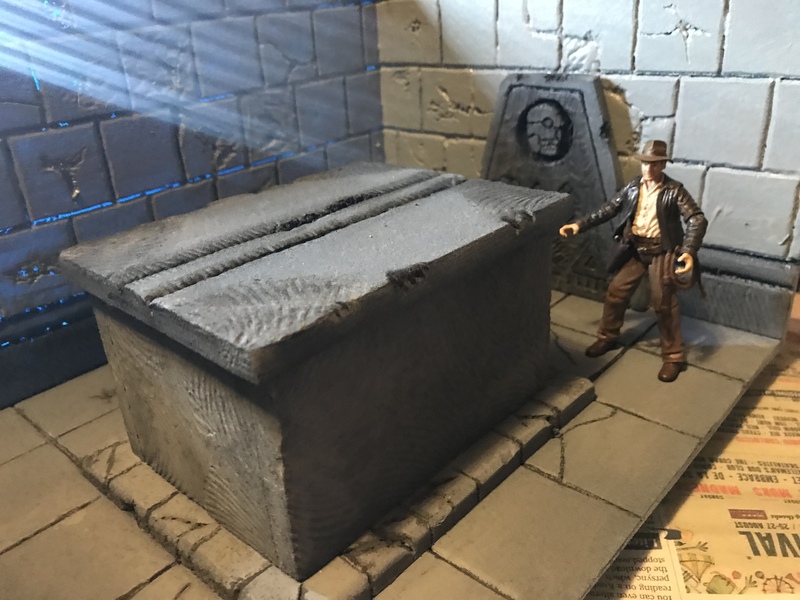 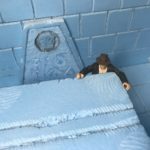 The final touches where added to the tomb, highlights of the cracks in the wall and around each brick, a slight covering of Halloween cobwebs spread over the back wall, inside the sarcophagus and over the lid. 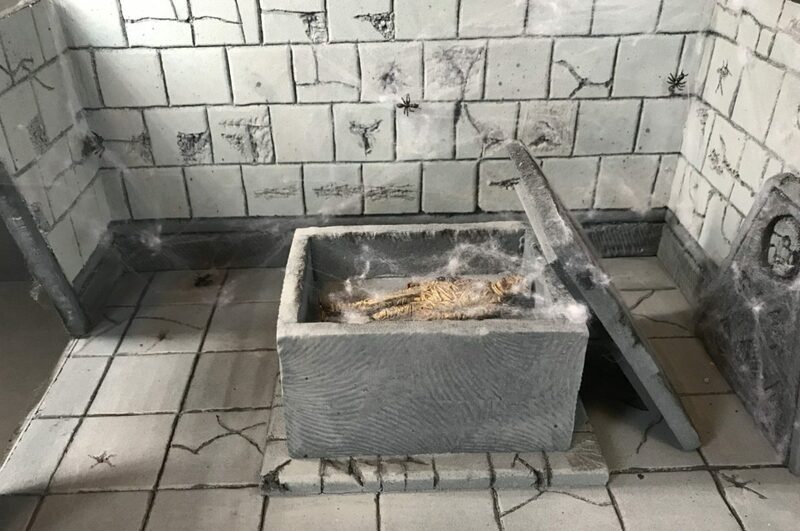 The odd small spider added for effect.